The SandForce SF3000 series has become the unicorn of the SSD industry. For the past two years there has been a lot of hype about the new controller, but Seagate/SandForce has kept missing deadlines one after the other. Initially the third generation SandForce controller was supposed to ship in mid-2014, but obviously that didn't happen. Next we heard Q4'15, which was then changed to mid-2015 and the latest word I got at Computex is expected mass production in Q4'15, meaning that we could see first products shipping in early 2016. The original paper launch back in late 2013 only included the SF3700 lineup, which was first supposed to cater all markets from entry-level client to enterprise. Last week Seagate announced that the SF3000 series has now been split into two: SF3500 for the client and SF3700 for the enterprise market. The reasoning behind the differentiation doesn't only lie in marketing as the SF3500 and SF3700 are separate dies with the SF3500 having four NAND channels whereas the SF3700 keeps the 9-channel design as announced previously. It makes a lot of sense to build a separate die for the client space and honestly I was a little skeptical about cost efficiency because it's practically impossible to build a silicon that is feature rich enough for the enterprise with a consumer friendly price tag. We've seen the client space moving towards 4-channel controller designs anyway, so I suspect introducing a smaller 4-channel controller was the only way SandForce could remain price competitive against Silicon Motion, which has taken a large share of SandForce's old clients. The SF3500 series includes three SKUs and similar to the SF3700 silicon the controller supports both SATA 6Gbps and PCIe 2.0 (although only two lanes, whereas the SF3700 features four). The SF3514 and SF3504 are SATA and PCIe respectively, but the SF3524 has a switch that allows it to operate in both SATA and PCIe modes similar to the SF3700 SKUs. Unfortunately the switch isn't user-accessible as it has to be toggled by the manufacturer, so it's merely a feature that helps the OEMs with inventory management. The SF3524, being the high-end model, also has more supported firmware features, but Seagate isn't disclosing any at this stage, although I was told they are more back-end related rather than concrete features that are visible to the end-user. Inherently the SF3500 is just a 4-channel version of the SF3700 and supports all SandForce technologies (DuraWrite, SHIELD, RAISE etc), but with one twist. The SF3500 is the first time SandForce is relying on external DRAM for caching the NAND mapping table, whereas the SF3700 and all older SandForce controllers only use the integrated SRAM. No user data is stored in the DRAM, so its function is purely to increase performance as well as reduce power up time when waking the system from sleep. Another separating feature is the RAISE support. 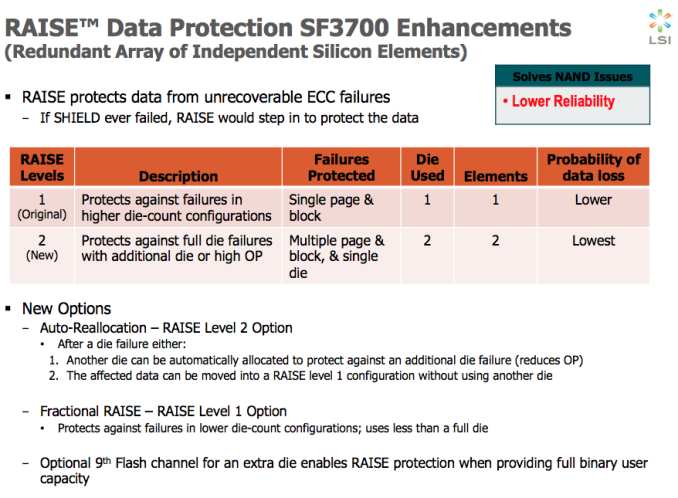 Because the SF3500 is client-oriented, it only supports level-1 RAISE, which uses one NAND die for protection against single page/block failures (in small capacity drives fractional RAISE can be used as it requires less than a full die). The SF3700 has full RAISE support and can operate in either level 1 or 2 mode with level-2 protecting against a full die failure (the 9th channel is there for that reason). SandForce's focus in the SF3000 series has been mixed performance from day one. While most modern drives boast excellent peak read and write performance, nearly every drive experiences notable loss in performance under mixed read/write workloads. We've been testing mixed performance as a part of our 2015 Client SSD Suite and I certainly agree with SandForce that it's an area where improvement is needed, which is what the SF3000 series is promised to do. Seagate's/SandForce's internal tests put the SF3700 at much higher performance efficiency than the competing NVMe drive that Seagate couldn't officially disclose (hint: the manufacturer starts with an I). 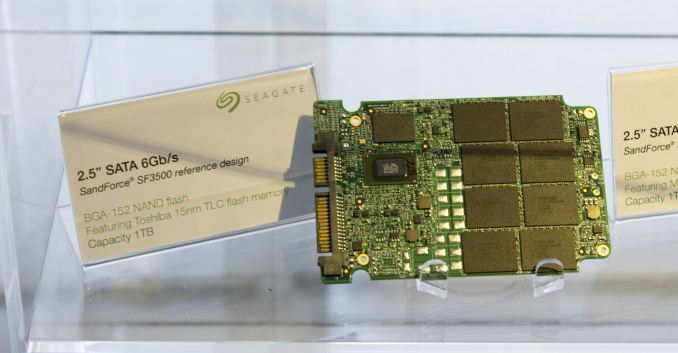 All in all, Seagate seems to be making progress with the SF3000 series. It's inevitably late from the original launch schedule, but on the other hand there are only a handful of client PCIe drives on the market right now, so if the new schedule sticks and the SF3000 is as good as Seagate is showing it to be, SandForce will definitely be back in the game. The Computex announcement was relatively high-level, but Seagate hinted that they will have a truckload of new details to share within the next two months, so we will stay tuned for more. You might be giving too much importance to the cost of the controller. It's a pretty small controller even if on 28nm and if it ends up in high capacity drives priced at 1$ per GB then the cost of the controller is less relevant and the consumer one will fail. Folks will go with higher speeds from others and what this offers is not enough to justify the cost of an upgrade. Would be great controller for mid-2014 but already outdated in 2016 when everyone moves to PCIe3 x4 for performance and x1 for cost and area savings. My first SSD was a crappy Agility (2?) in 2011, and even that budget drive cost about $120 for 60 GB. I think it was on sale, too. Still waiting for a decent 2 tb ssd for some 1 drive systems. No mention of the truly horrible unreliability of the first generation controller (especially in the Vertex 2 with 64-bit NAND) or the endless problems with TRIM of the second generation. In fact, this very site said, eventually, that TRIM just can't work properly because of Sandforce's compression scheme.